Our starter units make supplying and assembling shelving for your space easy. 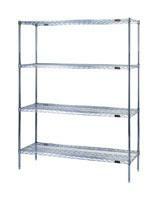 Simply snap the shelves and posts into place for four or five levels of storage. Chrome-finished units feature three different coats, ensuring a protective NSF-listed surface suitable for dry storage environments.